Richard A. Valicek was born to parents of Croatian descent in Canada. He is proud of his heritage, as his great grandfather use to take care of the Austrian kings horses before the first world war. He became intrigued by great storytelling being brought to life on paper. As he grew up, his ambitions as a storyteller merged into a career in visual arts, and he graduated with a degree in graphic design. In 2001, he began taking courses in writing and graduated with a diploma in the Liberal Studies program. He slowly began to develop what would become his first major work. His first book entitled: 'Alamptria: Red Moon Rising' was published in 2010 and went on to win the Buzzillions Reviewers Choice Award. Richard created a world we have never seen before. His creativity spawned fictional characters that would be a classic tale of futuristic knights in conflict with vampires. But this is not an ordinary story of knights; they have been given great power from what Richard calls the vim of Petoshine. The great elf wizard - Grongone; bestowed the swords of power to three knights from the city of Elysium; who would go on to shape the world to bestow freedom and peace. The dark lord has his eyes on the people of Alamptria and seeks to dominate the lands. They great oracle - Felicia the golden fleece guides the knights of Petoshine. Richard is working on a series of books of the Dead Path Chronicles. 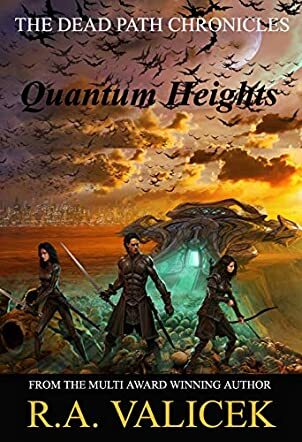 Quantum Heights by Richard A. Valicek is Book One in the Dead Path Chronicles, a story that will appeal immensely to fans of M.R. Mathias. The story begins with great action and the reader is seduced by the beauty of the language. The conflict is also introduced very early in the story. The introductory message is a powerful announcement that prepares the reader for a great adventure. The Elysian city of Alamptria receives a threatening message when the bodies of two agents are delivered to the king, dead. Now, the best two warriors are sent on a mission to investigate the crime and they get entangled in a plot that is deadlier than they could ever have imagined. They will have to fight their way through an army of vampires, encounter sly and deceitful characters, and meet with many dangers. Can they survive this mission and bring protection to their people? I just became a fan of Richard A. Valicek because of his great writing style. The prose is neat and the descriptions are captivating. The plot moves very fast and it is animated by a powerful conflict. The author has carefully imagined the plot to have the reader turning the page. There are many twists and surprising turns and readers will enjoy the way characters unfold throughout the story. The characters are well-developed and readers can easily relate to them. There is a lot of action, yes, heart pounding action, that also makes the read a compelling one. Quantum Heights: Book One of the Dead Path Chronicles is one of the best fantasy stories I have read since this year began and I will be looking forward to the next books in the series. It is a great opening for a compelling series.